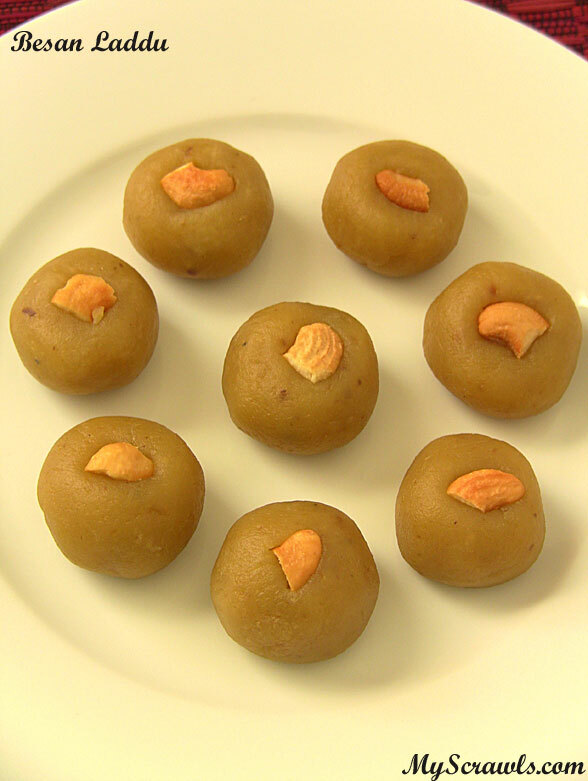 Besan ladoo is one of the famous mithai/sweet in Maharastrian cuisine. This recipe is usually prepared with chana (Bengal gram/kadalai paruppu) flour. Some use chickpea flour. You can find these flour at any Indian store. I do not use chickpea flour or sooji rava. I roast chana dal / kadalai paruppu and make a coarse powder of it. Mixie at home is more than enough to powder the roasted chana dal. Adding raisins/saffron is purely your choice. Though I would recommend using cashews in the recipe. Heat 2 tsp of ghee and fry cashews. Remove them from heat and add dal. Roast dal in ghee for 1-2 min till it turns slightly reddish brown. Add 2.5 cups of water (for 1 cup of dal) and pressure cook chana dal for 3 whistles. In a mixer, grind dal into coarse powder. Heat remaining ghee and add powdered dal, cardamom powder and sugar. Keep stirring until sugar gets incorporated with dal. As you keep stirring, the mixture would stick together and start forming a ball. At this point switch off the stove and allow the dal mixture to cool. 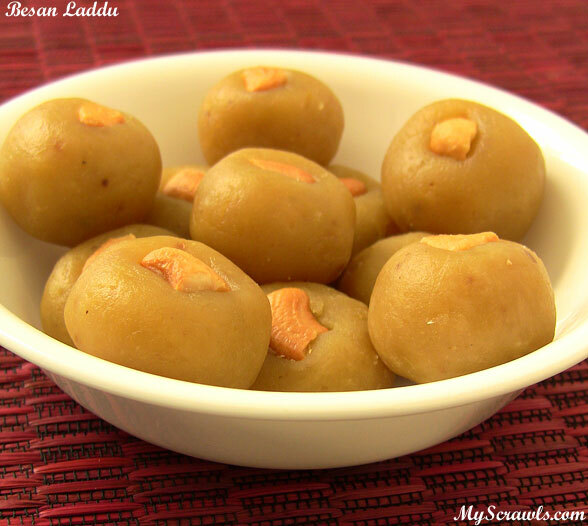 Add fried cashews and roll the mixture into small balls to enjoy yummy besan ladoo! Yummmmmmmmm, really its so delicious; Your besan ladoo picture is so good and inviting, i am really drooling.